Copper engraving published in 1745 by the Homann Heirs in Neuremberg. Size 46,0 x 55,5 cm plus ample margings. Coloured partly by a contemporary, partly by a later hand. 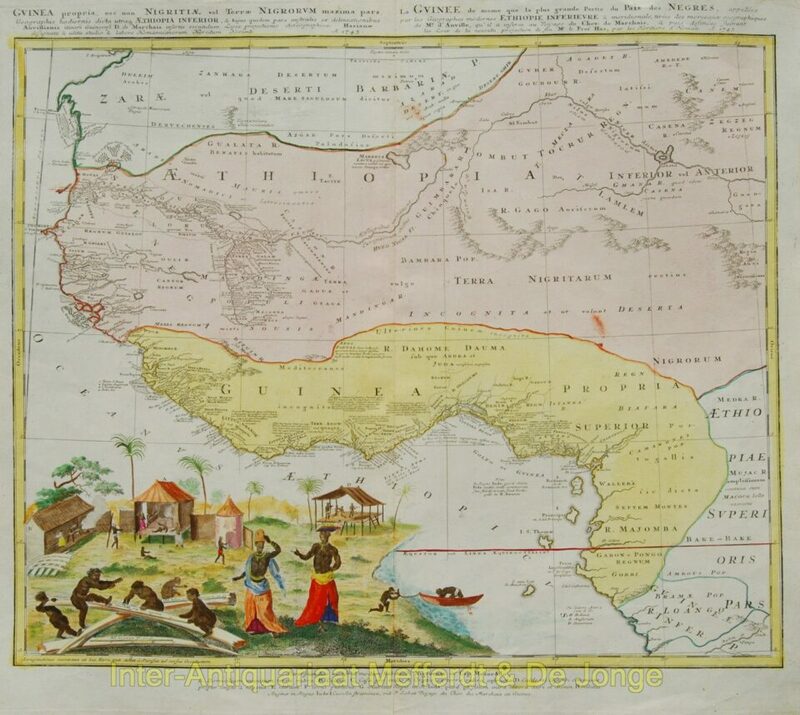 One of the finest maps of west Africa to appear in the mid 17th century! Details West Africa from Cape Blanc and Senegal to Guinea Inferior and the Cacongo and Barbela Rivers. Extends inland to including Ghana Lake on the Niger River as far as Regio Auri. The coast is highly detailed with numerous notations in Latin regarding the peoples and tribes of the region. The detail extends inland along some river valleys, most specifically the Niger, however, the map becomes quite vague the further the river flows inland. Features an elaborate engraving in the lower left depicting ivory, African tribespeople and a small village. Johann Baptist Homann (1663-1724), and his son, Christoph Homann (1703-30) founded 18th century’s most important German cartography firm around 1702 in Nuremberg. In 1715 the elder Homann was appointed “Imperial Geographer” by Holy Roman Emperor Charles VI. This privileged position gave Homann access to the vast resources which enabled him to produce the most advanced and accurate maps of his period. Johann Baptist Homann died in 1724. Six years after his father’s death, Christoph also retired from the map business on the condition that all future maps produced by the firm be published under the name of “Homann Heirs”.